Avapro is a very commonly prescribed medication that is used to treat certain conditions associated with high blood pressure. While it is generally considered safe, it can cause some serious side effects, including unexplained muscle pain or tenderness, high fever, lethargy and extremely dark colored urine. While these symptoms are not immediately life threatening, if they become bothersome or persist for longer than 24 hours, patients should contact their physicians in order to report the side effects and discuss the benefits of the treatment. Patients who experience any of these side effects should seek medical help. Never stop taking Avapro without consulting with a physician, however, unless a serious allergic reaction is suspected. Signs of this include hives, skin rashes, difficulty breathing and swelling of the face, lips, tongue or throat. Avapro has been assigned to the pregnancy category C during the first trimester and D during the second and third trimesters by the Food and Drug Administration. In essence, Irbesartan has been proven to cause significant fetal harm if the drug is used by pregnant mothers and it should be avoided. Patients who are pregnant should not use Avapro, and patients who become pregnant during treatment should speak to their physicians about an alternate means of treatment. Avapro passes into breast milk; nursing mothers should not breastfeed their infants while they are taking Avapro. The decision should be made to either stop taking Avapro or stop breastfeeding. While many physicians will not prescribe Avapro to anyone under the age of 16, clinical studies have been performed on children as young as six years of age and found that the benefits of the drug outweigh the risks in many cases. Children aged six years and older should start at a dosage of 75mg and increase to no more than 150mg, if necessary. The lowest dosage of the drug that adequately treats the symptoms in children should be used. In order to reduce the occurrence of gastrointestinal side effects, children can take the medication with food or milk. Patients under the age of 16 should be very closely monitored for serious Avapro side effects that can quickly become life threatening if not treated. The safety of Avapro in the elderly population has been shown to be equal to that in middle-aged adults. Even so, the blood concentrations may be increased in elderly patients, leading to a higher chance of experiencing some of the more serious side effects. Elderly patients should only use Irbesartan when the benefits of the medication clearly outweigh any of the risks associated with it. The dosage for elderly patients is usually the same as for young and middle-aged adults except for in extreme cases where extremely low body weight or other health conditions must also be considered. Who Should Not Use Avapro? 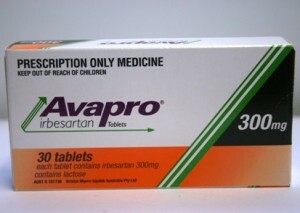 Although Avapro is considered safe when dosed properly, it should not be used by anyone who is under the age of six, people with kidney or liver disease, anyone with congestive heart failure, or anyone who regularly suffers from dehydration. Pregnant and nursing mothers should not take Irbesartan due to the increased likelihood of harm to the fetus or baby, and people who consume alcohol on a regular basis or who participate in binge drinking—drinking more than two alcoholic beverages in a single sitting—should not take Avapro. Patients should report any of these conditions to their physicians before beginning treatment with any new medication. For people with uncontrolled high blood pressure or kidney problems that stem from diabetes, Avapro can certainly make a huge impact in these patients’ quality of life. In order to take the medication responsibly, however, these patients should be aware of all of the Avapro side effects that they may experience.